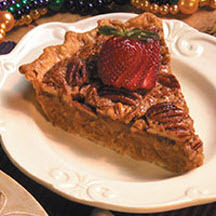 Marilyn's recipe for her scrumptious sweet potato pecan pie from Tunk’s Cypress Inn in Boyce, Louisiana. For Sweet Potato Layer: Mix ingredients together. Spread into . For the Pecan Layer:Mix together ingredients and pour over the first layer. Bake on a sheet pan in a preheated oven at 325°F (160°C) for 1 1/2 hours. Cool. Top individual servings with a dollop of whipped cream, if desired. Recipe and photograph provided courtesy of Louisiana Sweet Potato Commission and Tunk’s Cypress Inn in Boyce.